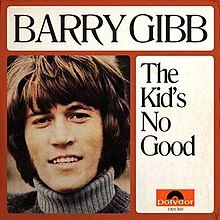 The Kid's No Good was to have been Barry Gibb's debut solo album following his departure from the Bee Gees in December 1969. There was no official title given to the album at the time. The line "the kid's no good", which the album is commonly titled on several bootleg releases, is also featured in the Bee Gees song "Come Home Johnny Bridie" on the 1973 album Life in a Tin Can. The album features orchestral arrangements by Bill Shepherd who performed the same role for the Bee Gees from 1965 to 1972 (Robin and Maurice Gibb's solo recordings were done with different arrangers). On 1 December 1969 Barry Gibb announced his departure from the Bee Gees and that he would carry on as a solo artist instead. He would spend the following months writing new material for his solo album. Few of the songs were released. "It's not the same orchestra as we used with the Bee Gees", Gibb explained, "But Bill Shepherd is the only arranger I'll ever work with". I love country music and I probably allowed a little more than I should have to influence me. But I do music that I enjoy and hope that everyone else will enjoy it too. If you try to work for whatever everyone else wants, I think that you get lost." Gibb began recording the album on February 15, 1970 with four songs: "I'll Kiss Your Memory", "The Victim", "Moonlight" and "Summer Ends". The latter two were held off the album and instead offered to other artists for later release. On February 20 Gibb recorded "It's Over", also known as "I Just Want to Take Care of You". On 22 February he recorded "A Child, A Girl, A Woman", "Mando Bay", "Born", "Clyde O'Reilly", and "Peace in My Mind", On 9 March he recorded "What's It All About", "This Time" and "The Day Your Eyes Meet Mine", and on 23 March he recorded the last two songs, the upbeat pop number "One Bad Thing" and the soft ballad "Happiness". Other musicians are uncredited but P.P. Arnold, with whom Barry was working with at the time, can be heard singing backing vocals on some songs. "I'll Kiss Your Memory" and its B-side "This Time" from these sessions were released as a single (Polydor in much of the world, Atco in North America) but did not chart. The songs "One Bad Thing" and "The Day Your Eyes Meet Mine" were proposed to be released as a single around October 1970. Both songs had originally been written by Barry and Maurice Gibb and recorded during the Cucumber Castle sessions but left unused, the versions for his solo album were however new recordings. Atco's initial batch of the follow-up single, featuring a sole song-writing credit for Barry for both songs, were destroyed although a few copies have survived and are considered collectors items today. At the last minute it was decided to focus on a new Bee Gees release instead. AllMusic's Bruce Eder described "Mando Bay" as 'moody' and "One Bad Thing" as 'Beatlesque' adding "Sounds here are of a piece with the Bee Gees' late sixties output, and they're worth owning by any admirers of the trio who are interested in stretching their legacy as far as possible'. All tracks written by Barry Gibb, except where noted. This is most likely the intended line-up although available sources differ as to the placement of the first and last tracks. Various bootleg releases add a number of additional tracks recorded both during and long after the album's recording sessions. P.P. Arnold — backing vocal on "Born"
Although technically not considered cover versions, since most of the songs were not officially released, many of the songs were offered to and recorded by a number of different artists over the following years. Wildwood covered "One Bad Thing" released as a single in 1971. The Freshmen covered "One Bad Thing" released as a single in 1971. New Horizon covered "One Bad Thing" released as a single in 1971. ^ "Bee Gees at IBC". IBC Studio. Archived from the original on 24 October 2013. Retrieved 22 March 2013. ^ a b Sandoval, Andrew (2012). The Day-By-Day Story, 1945–1972 (Paperback) (1st ed.). Retrofuture Day-By-Day. pp. 102–115. ISBN 978-0-943249-08-7. ^ a b Hughes, Andrew. The Bee Gees - Tales of the Brothers Gibb. Retrieved 22 January 2014. ^ Brennan, Joe. "Gibb Songs : 1970". Archived from the original on 24 October 2012. Retrieved 20 January 2013. ^ Eder, Bruce. "Barry Gibb – The Kid's No Good". Allmusic. Rovi Corporation. Retrieved 30 April 2013. ^ "I'll Kiss Your Memory: 1969/1970 The Kid's No Good". BarryGibb.com. Archived from the original on 22 April 2012. Retrieved 20 January 2013. ^ Brennan, Joe. "Gibb Songs : 1970 – selected record releases". Archived from the original on 24 October 2012. Retrieved 20 January 2013. 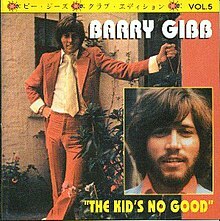 ^ "Barry Gibb: The Kid's No Good". Archives.org: Discogs.com. Retrieved 3 February 2013. ^ Sandoval, Andrew (2012). Bee Gees: The Day-By-Day Story, 1945–1972 (First ed.). RetroFuture Day-By-Day. pp. 105–107. ISBN 978-0-943249-08-7. ^ a b c "One Bad Thing – Wildwood / Ronnie Burns / The Freshmen / New Horizon". Poparchives.com.au. Archived from the original on 20 March 2012. Retrieved 20 January 2013. This page was last edited on 16 November 2018, at 08:42 (UTC).